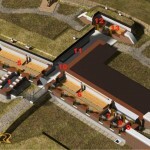 In the 1880ies the basic layout of the fortress Przemyśl was constructed as a circle of artillery forts around the city. In the following decade the circle was completed. Between the main fortifications several smaller and less armed forts were constructed. Fort VIIIa ‘Leśniczówka-Łętownia’ was a typical example of such a Zwischenwerk. It had a eliptic outline, with a full-profiled moat in its gorge and a sloping moat on the remaining parts of its circuit. The barracks were placed in the gorge, from where the communication with the front part was carried out through a poterne in the capital. The casemate in the saillant part of the fort included a dressing room and ammunition storage. The end of the poterne in the saillant also functioned as a hangar for two cannons. From there and also from the barracks wings there was a path to reach 4 gun emplacements and the infantry positions. 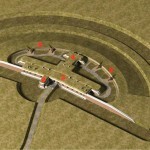 The main task of the fort was to cover the interval between fort VIII ‘Łętownia’ and fort IX ‘Brunner’. Before the war broke out, there were plans to upgrade fort VIIIa ‘Leśniczówka-Łętownia’ as the centre of an separate group of forts, however it got combined with the fortification group of fort VIII ‘Łętownia’ during the war. Fort VIIIa ‘Leśniczówka-Łętownia’ was under heavy Austrian artillery fire during the recapturing of the Przemyśl fortress from the Russian army between May and June 1915. The damage caused during that period made the demolition of all the brick walls easier in later years and so only the foundations and the some walls were preserved. Currently the remains are entirely covered under the surface and not visible. Werk VIIIa ‘Leśniczówka-Łętownia’ war ein typisches Zwischenwerk. Seine Aufgabe war die Sicherung des Intervalls zwischen den Hauptwerken VIII und IX. Es hatte eine relativ kleine Infanteriebesatzung und vier leichte Geschützen in Hochwalllafetten. Der elliptische Wall war in der Kehle durch ein Kasemattkorps geschlossen, das Unterkunftszwecken diente. Eine Kapitalpoterne führte von dieser Kehlkasematte in den Saillant, wo sich ein Verbandslokal, ein Munitionsmagazin und ein Geschützhangar befand. Das Zwischenwerk wurde bei der Rückeroberung der Festung im Mai/Juni 1915 von der österreichischen Artillerie stark beschädigt. Diese Zerstörungen führten in den Folgejahren zu weiterem Verfall und Abtragungen. Heute sind nur noch Fundamente und einzelne Mauerteile erhalten, die jedoch unter der Erdoberfläche liegen. Vom Zentrum von Przemsyl aus hält man sich zuerst auf der Straße „Ignacego Paderewskiego“ und dann auf der „Generala Jozefa Wysockiego“ nordwestlich in Richtung Ujkowice. Bei der Obronna Straße biegt man scharf links in diese ab. Nach ca. 500m befindet sich rechts ein Waldstück in dem das Zwischenwerk lag. From the city centre follow first „Ignacego Paderewskiego“ and then the „Generala Jozefa Wysockiego“ street in the north-west direction. Once you have reached the „Obronna street“ turn left and after approx. 500m you will see a forest to your right where the fort was situated.